Delivering 27,907,239,570 hits to websites since 2011. 1. In order to redeem your free signup points, you must surf your first 20 pages. I own a video game blog that has helped promote many online games from large game companies around the world. I had a hard time gaining traction and readers for my articles until I discovered 10KHits. It gave me the website traffic boost I was looking for. There are no other traffic exchanges that works better than 10KHits. I like how easy it is to setup your first campaign and receive thousands of visitors instantly. It is a quick and affordable way to grow your website, business or blog. Your service is great! I am very satisfied and I hope everyone gives 10KHits a chance. Since using it, I have received a ton of traffic. I like how I can adjust the website settings to best fit my target demographic. With the knowledgebase, I am able to learn more about SEO and social media marketing for free. My final words are a big thank you to the 10KHits team! It is simple, easy, and non-time consuming. Best service to drive traffic to your webpages. The surf feature is very easy to use. 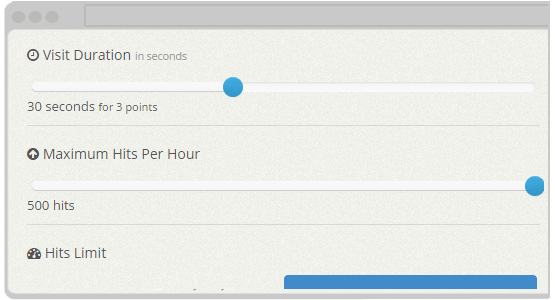 Moreover, you can add points whenever you want which makes it convenient. 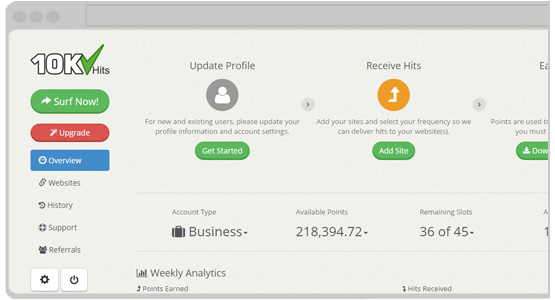 Even at 80% surf ratio using the free basic account, it is sufficient to make 500 visitors in 2-3 hours which is good. At first I thought it would be just another traffic exchange site, but in the last month our site has received thousands of quality visits. I was shocked and very happy with the audience of our website and now I can always rely on 10KHits, the best traffic exchange in the world! See for yourself! Great, consistent and reliable! I'm on many traffic exchanges and 10KHits is the best traffic exchange I've used! Anyone trying to promote a web site can't afford not to be a member - I've been on more than 2 years without a single complaint! I also don't recall any instance of downtime. Start with a Free Plan! It's 100% free. There's no catch. You can upgrade any time according to your needs! Running out of points or just want to boost your traffic intake? Get an extra 50,000 points with this booster pack. 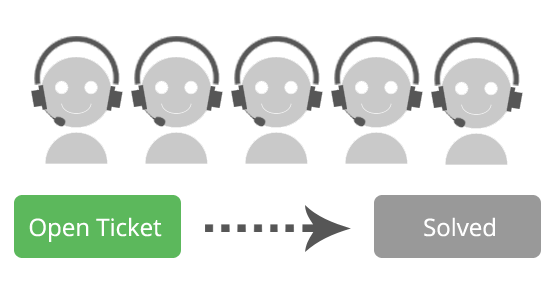 Add 10 extra website slots to your account so you can increase the amount of pages in rotation.